Motorola is gearing to launch the Moto 360 (2015) smartwatch in India on December 1. The company has even rolled out invites for the launch of the Android Wear. 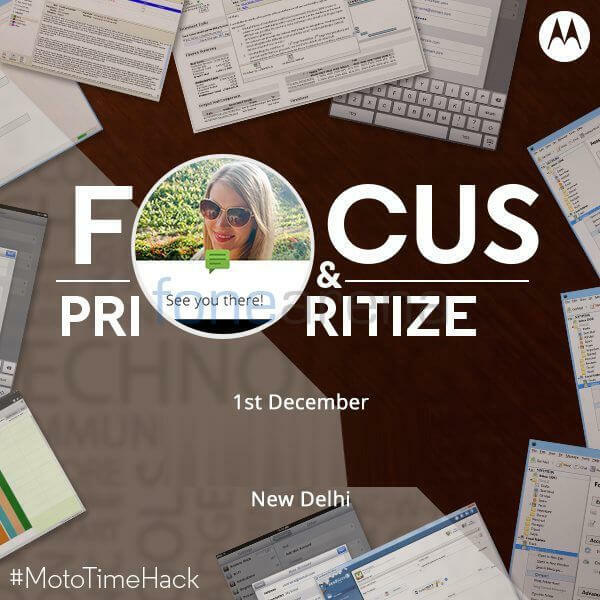 The invite image shows a circular dial and a hashtag #MotoTimeHack. To refresh your memory, the Moto 360 (2015) was announced few months back at the IFA Berlin this year. The new Moto 360 is a successor to the Moto 360 that was launched a year ago. The Moto 360 (2015) will be available in two different sizes for men, along with a special edition for women. There is another variant of the new Moto 360 as well, which is dubbed as the Moto 360 Sport. The two different sized variants for men come with a 46mm body and a 42mm body respectively. The display on the bigger sized variant is 1.56-inch with a resolution of 360×230 pixels, while the smaller sized one has a 1.37-inch display with a resolution of 360×225 pixels. These two new variants are much more compact and have lesser bezels than the last year Moto 360. The 46mm variant is backed by a 400mAh battery, while the 42mm display is backed by a 300mAh battery. Pricing and availability details of the smartwatch in India are still under wraps. Although, their prices in the US range from $299.99 to $429.99, which converts to approximately Rs. 20,000 to Rs. 29,000 in Indian currency. Stay tuned with us for more information about the Moto 360 (2015) launch in India.